Today, there are very few men who feel comfortable going about in public in short pants and tights. Well, maybe with the exception of ballet dancers, gymnasts, or trapeze artists. And yet, a little over two centuries ago, most men of the upper classes would not be caught dead in anything but. They believed their shapely legs, encased in finely knitted stockings or hose, were not only one of their most manly features, but those garments, costly, delicate, and quite inappropriate for physical labor, set them apart from the lower classes. And so it had been for more than five hundred years. For all those centuries, only peasants, working class men and sailors wore loose nether garments of study cloth which extended below their knees, in many cases all the way to their ankles. Aristocratic males most certainly did not wear such coarse garments. For more than half of the eighteenth century, as had been the practice for centuries before, babies of both sexes were swaddled for the first year or so of their lives. After that, both little boys and little girls were put into frocks, until it came time for the boys to be breeched, usually between five to seven years of age. At that time, the boys were put into garments which were nearly exact miniatures of those worn by their fathers. Garments which were stiff, scratchy, generally uncomfortable, tight, constricting and absolutely no fun to play in. Then, in 1693, John Locke published his treatise, Some Thoughts Concerning Education. Locke, a liberal and enlightened scholar and physician, provided advice in his treatise on the education of the sons of the aristocracy. In addition to the training of those young minds, Locke also provided advice on how these young boys should be clothed. The aristocracy, rank and status conscious, in general unwilling to surrender their fashionable breeches, paid Locke little heed in the first half of the eighteenth century. Yet by mid-century, there were a number of independent and rebellious aristocratic youths who took to wearing the garments of the lower classes, including, to the horror of their parents, the long trousers worn by peasants and sailors. This appeared to be a passing fad, until Jean-Jacques Rousseau published his novel, Émile: or, On Education, in 1762. Rousseau considered this his most important work. Influenced by the writings of John Locke, he wrote about the nature of education, and how he believed that young men would be healthier and could retain their innate goodness if they were raised in an open and natural environment. Rousseau was one of the first philosophers to insist that children should not be dressed as miniature adults. He believed their childhood should be recognized as a separate phase of life, and that they should be clothed accordingly. In particular, he espoused the, for the time, very peculiar notion that children need not be clothed to display their rank, wealth and social standing. Rather, he called for young boys to be dressed in garments which allowed them to move freely, without the need to be mindful they were wearing expensive fabrics and embellishments. In Émile, Rousseau wrote: "Before the child is enslaved by our prejudices his first wish is always to be free and comfortable. The plainest and most comfortable clothes, those which leave him most liberty, are what he always likes best." In the eighteenth century, the English maintained a curious ambivalence with regard to all things French, and it took some time for Rousseau’s principles to be adopted in England. However, from the mid-1760s, a few enlightened parents did have their young sons clothed in a simple suit of even-weave linen when they were breeched. This suit consisted of a simplified cut-away jacket without tails, but with the more functional slit cuff, and, instead of breeches, fastened tightly below the knee, a matching pair of loosely cut trousers, which fell to mid-calf or even to their ankles. Since trousers had been worn only by the lower, subordinate classes for centuries, trousers were considered acceptable wear for upper-class young boys, even preferable, as they were a mark that these young males were subordinate to the adult men of the family. Under their jacket these young boys wore a white linen shirt made similarly to a man’s shirt, with a frilled collar which was tied closed high at the neck with a ribbon, usually black. Though not completely open, this collar treatment was preferable to the very formal and intricately tied cravats in which their fathers were confined. Then, in 1779, the Lady’s Magazine printed what amounted to a plagiarized version of Émile (there were few copyright laws at this time, and few of those were respected). The wide circulation of the Lady’s Magazine brought the principles of simple, comfortable clothing for young boys to the attention of a much broader public. A public, particularly upper and middle-class mothers, who were very receptive to the idea that their little boys need not be turned into dwarfish men as soon as they were out of frocks. Equally attractive to these caring mothers was the notion that such garments were more moral and healthful for their little boys than scaled-down adult male clothing. Beginning in the 1780s, most upper and middle-class young boys were dressed in what came to be known as a skeleton suit once they were breeched. This suit had evolved from a combination of the simple trouser and jacket suits which some little boys had worn in the previous decade and the current dress of ordinary English sailors. Thus, the cut-away coat gave way to the round coat, which might retain the double-breasted button pattern of its predecessor, but might have just a single line of buttons instead. Some of these coats had no cuffs, since their sleeves were only elbow-length. If they had sleeves, they had either the plain slit cuff, or a simple cuff which buttoned at the wrist, but none had the heavier, folded-back cuff found on most adult coats. Most of these coats were cut to fit close to the body, but with enough ease that they were not tight or constricting.As with earlier suits for little boys, trousers, either calf or ankle-length, at the front having split falls (whole falls extended from one side seam to the other, while split falls consisted of a more narrow central flap), and usually whole falls at the back, to complete the ensemble. The shirt, usually white, which was worn under the coat, was also similar in style to the shirts worn by boys of the previous decade. But now, it was just as likely to be made of cotton as of linen. The ruffled or frilled collar was no longer tied closed with a ribbon. Instead, it was allowed to remain open, falling over the shoulders. Both the jacket and the trousers were made of the same fabric, by this time, very often of nankeen, though they might also be made of other sturdy, washable cotton or linen fabrics. Boys typically wore no undergarment except their shirts at this time, though there is evidence in a number of letters and diaries of the period that at least some mothers had separate linen or cotton "linings" made for their sons’ trousers, to "ensure proper cleanliness" and probably lengthen the usable life of the garment. A tight waistband was not very comfortable for active little boys, but they would have soon lost their trousers without some safeguard. Belts and suspenders (braces) were not made for little boys until well into the Victorian period. However, it was not long before the practice of buttoning the top of the trousers to the bottom of the jacket evolved. It is this feature, in particular, that distinguishes the garment we know today as the skeleton suit. For most of the 1780s, toddlers, both boys and girls, wore frocks which were usually bound with a broad, colorful sash at the waist. After they were breeched, most boys retained this sash around their skeleton suits. Perhaps the sash was used to cover the buttons which joined the jacket and trousers, as they were often very plain. But over time, skeleton suit buttons became quite decorative and ornate. By the 1790s, the sash was only used for more formal occasions and it appears to have been completely abandoned soon after the turn of the nineteenth century. The use of the sash may have been relinquished, at least in part, due to the rising waistline of skeleton suits. In the last decades of the eighteenth century, the jacket and trousers of a skeleton suit were buttoned together at the natural waistline. But as the classical influence on fashions caused the waistlines of women’s and girl’s gowns to rise, so, too, did the waistlines of skeleton suits. By the Regency, skeleton suit waistlines were only a few inches below the under-arms. Another change to the skeleton suit, which began gradually, near the end of the eighteenth century, was the color. The early skeleton suits had been of one solid color, most often the yellow-ish buff color of undyed nankeen cloth. This was very convenient, as these garments had to be laundered regularly and plain, undyed cloth would best conceal the wear and tear to which they were subject, both by their wearer and the laundress. But improved dyeing techniques made it possible, by the early nineteenth century, to produce cloth in a selection of colors which were much more colorfast, that is, they would retain most of their color after multiple washings. Though these improved dyeing techniques did produce a wider selection of fabric colors for use in skeleton suits, the finished fabrics often had quite a distinctive aroma, imparted to them by the chemicals in which they had been dyed. Typically, the darker the color, the stronger the odor. Some of those who wore skeleton suits made of these fabrics in their youth recalled the often less-than-pleasant smells of their new suits in their memoirs, even when writing many decades later. By the Regency, a deep blue was a very popular color for skeleton suits. In some cases, particularly for more formal occasions, a pair of blue trousers would be paired with a striped jacket. The stripes were usually vertical, with blue and white or red and white stripe combinations the most popular. The shirt remained much the same as it had since the eighteenth century, in fine white cotton or linen with a frilled collar left open at the neck. From the late eighteenth century, right through the Regency, little boys no longer wore their hair powdered. Most wore it loose and casual, usually long enough to touch their collar, but not long enough it could be tied into a queue. At this time, small boys were not subjected to curling papers, irons or pomades. On special occasions, boys would wear a round hat with a brim, usually of straw, with a wide ribbon band. However, most of the time these boys would go bare-headed, even upper-class little boys, especially while they were at play. Typically, boys wore plain white stockings and simple, flat-soled shoes with single strap over the instep with their skeleton suits. Boots were not a form of footwear made for children at this time, even for boys. For outdoor play or walking over rough ground, a more sturdy pair of shoes would be worn, usually with thicker stockings. In damp or cool weather, a pair of gaiters would be used to cover the lower legs and ankles. These gaiters were usually attached to the shoe tops, so that boys could walk through damp grass or brush without soaking their stockings or the lower legs of their skeleton suits. However, then, as now, boys will be boys, and out from under the watchful eye of a parent or governess, mud puddles, marshy areas or shallow streams might simply demand exploration. Needless to say, even the sturdiest shoes and gaiters would not protect against the results of such adventures. The 1779 issue of the Lady’s Magazine was probably the first, but certainly not the last fashion periodical to devote a small area of its pages to the clothing of children. From the last decade of the eighteenth century, there were occasional fashion plates which included illustrations of garments for children. At first, most of these children’s fashion illustrations were of clothing for girls. Just before the Regency, some fashion magazines also began to include the random illustration of new boy’s fashions, usually just for little boys. As the decade of the Regency progressed, more and more fashion magazines included illustrations for outfits for children of both genders, usually two or three times a year. Teen-aged boys of the upper and middle classes would have had their clothing made by their father’s tailor. But clothing for younger boys was most often made by their mother’s dress-maker or seamstress. Therefore, it made sense to place the new designs for little boys’ clothing in the same pages in which their mothers would be seeking new designs for their own gowns. But the infrequency of these children’s fashion plates had the effect of lengthening the duration of children’s fashions, as there were fewer references available for new designs. Since skeleton suits did not come ready-made, there were many variations on a basic theme over the decades, often based on the illustrations from fashion magazines. In most suits, the upper edge of the trousers was buttoned over the lower edge of the jacket. But there are a few surviving skeleton suits in which the lower jacket edge was buttoned over the upper edge of the trousers. As the eighteenth century came to a close, some skeleton suit jackets had a single line of buttons up the front, with a pair of button lines which ran from the lower edge of the jacket, widening as they rose, to end at the point of the shoulder, similar to the lines of buttons on some military uniforms. This button pattern remained popular right through the Regency, though with a number of variations. With the introduction of more colorfast fabrics, in a range of colors and shades, shortly before the Regency, skeleton suits of that period were made in many colors, from pale pastel shades to deeply saturated darker colors. By the turn of the nineteenth century, most skeleton suits were made with a round jacket having long or elbow-length sleeves, though there are a few mentions in period documents of a "vest" rather than a jacket, with the implication of a sleeveless upper garment. Some suits had trousers which extended only to mid-calf, rather than all the way to the ankle. It appears that these skeleton suits with short or no sleeves, and shorter trousers were reserved for country wear, especially in warm weather. There is no evidence as to whether or not the sleeves of the shirts which were worn with these abbreviated skeleton suits were shortened, but there is also no evidence to suggest they were not. There is also some suggestion that, in summer, skeleton suits might be worn with no shirt at all, on the most informal of occasions. This was most common with suits into which a boy’s mother had added linings. Little boys were, by this time, allowed more leeway in their dress than were adult men, particularly when out of the public eye. Before we proceed further, it is necessary to examine the name of this garment which young boys usually wore during the Regency and the decades before. Today, it is most often called a skeleton suit, and there are a number of reasons given for that name. One source says the name evolved because most little boys who wore this garment tended to be quite slender, and, since these garments had a slimmer cut and were less bulky than adult garments, they gave their slim wearers a skeleton-like appearance. Another source maintains that because the two main garments were buttoned to one another when worn, they gave the appearance of "a kind of jointed continuity" not unlike a skeleton. Yet another source maintains this name did not come into use until a few years before the Regency, when the waistline had risen to just below the under-arms and the trousers had become particularly narrow. Such a suit, on a slender boy, with the "jointed continuity" of long, thin trousers buttoned to a fairly close-fitting, high-waisted jacket, gave the little boy the appearance of a skeleton. Most curious of all is that the Oxford English Dictionary lists the date of the first use of the term in print as 1836, in Charles Dickens’ Sketches by Boz, which was published that year. 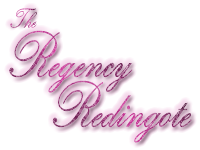 But that does not necessarily mean the term was not in use during the Regency and even before. It only means this is the earliest use of the term in print which the lexicographers of the OED have encountered. In a number of books and articles which I have read over the years about the development and maintenance of the OED, the majority of OED lexicographers assume that most of the words or terms listed in their historical dictionary may have been in use in the vernacular, that is, in common verbal speech, for as much as fifty years before they find their way into print. There is also the fact that Dickens was born in the second year of the Regency, 1812. It is almost certain he would have worn these garments himself, as a young boy, in the last few years of the Regency. More than likely, he refers to them in his writing using the same name he had used for them as a child. Therefore, it does not seem unreasonable that the term "skeleton suit" was used for these garments during the Regency, even if the OED cannot currently confirm it. It is more difficult to know if the term "skeleton suit" was used on the Continent during the Regency, primarily because no dictionary comparable to the OED exists for any other language. There is no doubt, however, that this type of garment for young boys did cross the Channel before the eighteenth century had come to a close, and it was very popular in a number of countries there. Though parents in many countries did adopt the garment for their children, those hostile to Britain often called it a "sailor suit," rather than a "skeleton suit." In France, in particular, it was known as a matelot, which translates simply as "sailor." This is not at all inappropriate, though rather ironic, as the skeleton suit was partially based on the dress of ordinary English seamen of the eighteenth-century. Regardless of its name, this suit was worn by a significant percentage of young upper and middle class young boys across Europe throughout the Regency. It is interesting to note that there were several Continental fashion observers who felt that in England, where the skeleton suit was worn almost universally by young upper and middle class boys, this essentially utilitarian and comfortable garment was the most likely reason that England consistently produced a smaller crop of fops and coquets than either France or Italy, where little boys, particularly of the aristocracy, were still sometimes dressed as miniature adults as soon as they were breeched. Typically, little boys wore skeleton suits until they were about eleven years of age. At that time, they would leave off their skeleton suits and begin wearing a slightly modified version of adult male clothing until they neared their majority. The skeleton suit remained in fashion until the mid-1830s, but then it slowly lost ground as other clothing styles for young boys became popular. By the 1840s, the skeleton suit was considered very old-fashioned. But by then, it had served a purpose for which it had not been intended by all those parents who had dressed their little boys in them. These parents had chosen the skeleton suit as the first garment their little boys would wear once they had left off wearing frocks. The trousers of the skeleton suit were acceptable for wear by little boys, in the eyes of their fathers and grandfathers, because they wanted these young family members to be clearly seen as male, but subordinate, not yet of an age to hold any power or challenge their elders in any way. What these fathers and grandfathers did not anticipate was that having worn these comfortable trousers for several years, these young boys had none of the prejudices against them which their elders held. Those young men who came of age after the turn of the nineteenth century did not care for the old-fashioned and constricting knee-breeches their fathers and grandfathers preferred. These young men did not equate trousers with the lower classes, they considered them both comfortable and appropriate garments, even for formal wear. Of course, they were not interested in the crude, poorly cut garments of coarse cloth worn by working men. Fortunately for them, even before the Regency began, English tailors were already acknowledged the best in the world. These young bucks had their trousers and pantaloons made by the best tailors, of the best fabrics, cut to fit them perfectly. Few of them would ever choose to wear knees breeches, unless they had no other choice, such as when attending formal functions, like the King’s Drawing Room, or a Wednesday night assembly at Almack’s. The things a young man would endure in pursuit of a young lady who had piqued his interest!